The first commemorative Netherlands stamps appeared in 1907. Between 1907 and 1924 the commemorative stamps of the Netherlands highlighted significant people and events in Dutch history. The first commemorative stamps of the Netherlands were issued on March 23, 1907 to celebrate the 300th Anniversary of the Birth of Admiral de Ruyter. The designs of the three stamps shown above (NVPH #87-89, Sc. #87-89) feature Admiral de Ruyter and and his fleet. 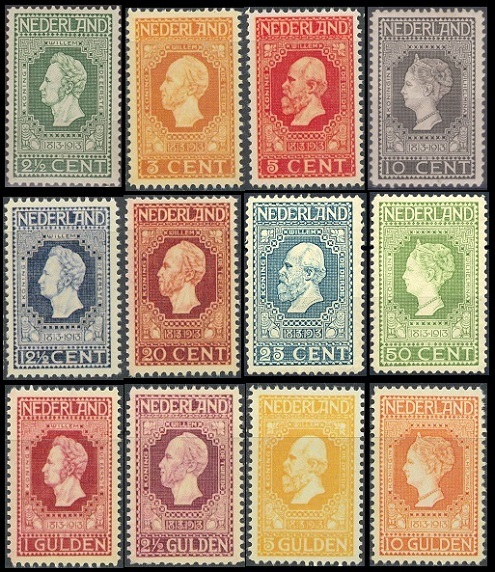 The twelve Netherlands stamps shown above (NVPH #90-101, Sc. #90-101) were issued on November 29, 1913 to celebrate the 100th Anniversary of the Independence of the Netherlands from Napoleon's French Empire. In 1813, Prince William of Orange and Nassau became the first constitutional monarch of the new Sovereign Principality of the Netherlands, now known as the Kingdom of the Netherlands. King William I (Lived: 1772-1843, Reigned: 1815-1840) on the 2 1/2 Cent, 12 1/2 Cent, and 1 Gulden denominations. King William II (Lived: 1792-1849, Reigned: 1840-1849) on the 3 Cent, 20 Cent, and 2 1/2 Gulden denominations. King William III (Lived: 1817-1890, Reigned: 1849-1890) on the 5 Cent, 25 Cent, and 5 Gulden denominations. Queen Wilhelmina (Lived: 1880-1962, Reigned: 1890-1948) on the 10 Cent, 50 Cent, and 10 Gulden denominations. Only 20,000 of the 10 Gulden denomination stamps were printed, thus they are very rare and quite expensive today. The other denominations in the set are relatively affordable. The eleven commemorative Netherlands stamps shown above (NVPH #121-31, Sc. 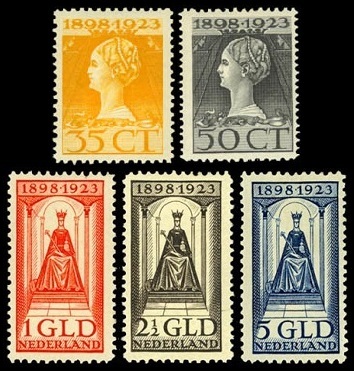 #124-34) were issued during October 1923 to celebrate the 25th Anniversary of the Investiture of Queen Wilhelmina. 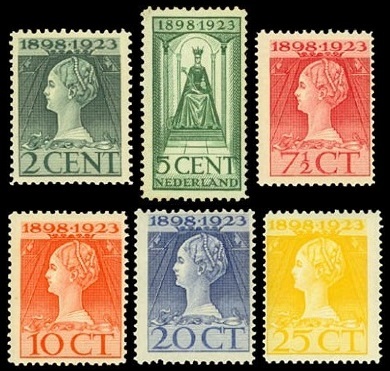 The four "tall" stamp denominations depict an enthroned monarch, and the other stamp denominations feature a youthful profile of Queen Wilhelmina. The two stamps shown above (NVPH #139-40, Sc. #140-41) were issued during September 1924 to celebrate the 100th Anniversary of the Royal Dutch Lifeboat Society. The designs feature a ship in distress (2 C.) and a lifeboat (10 C.). The Royal Dutch Lifeboat Society, now called the Royal Netherlands Sea Rescue Institution, was founded in 1824 as a voluntary association tasked with saving lives at sea. Today, it maintains 39 lifeboat stations along the Dutch coast. Between 1824 and 2006, they answered 36,358 distress calls and have rescued 79,887 people from distress situations. This institution is entirely financed by public donations. Lieutenant-Admiral-General Michiel Adriaenszoon de Ruyter (1607-1676) is one of the most revered mariners and naval officers in Dutch history. He is most remembered for his victories in the Anglo-Dutch Wars of the 17th Century. 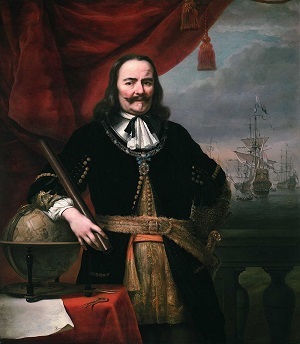 He was also victorious in skirmishes against the French, Spanish, and Swedish navies, leading to the Netherlands position as one of the dominant maritime powers of the 17th Century. He was a pious person, and he was much loved by both his sailors and soldiers, earning him the nickname "Bestevaer", the Old Dutch word for "Grandfather". 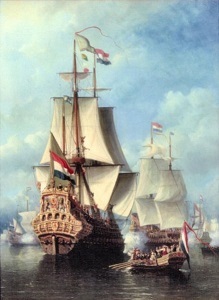 The name of Admiral de Ruyter's flagship, depicted in the 1857 painting shown above, refers to an epic event in Dutch history. The "Seven Provinces" were the Duchy of Gelders, the County of Holland, the County of Zeeland, the Bishopric of Utrecht, the Lordship of Overijssel, the Lordship of Frisia, and the Lordship of Groningen and Ommelanden. When Spanish rule ended in 1581, these provinces joined together to form the Republic of the Seven United Provinces, otherwise known as the Dutch Republic.